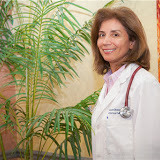 Are You In Need of a Physician in Ashburn? From urgent care to primary care, Medics USA is here for you. Are you in need of a new primary care doctor? Just wondering where the nearest urgent care center is? Regardless of your needs, at Medics USA, our goal is to provide you with exceptional care at every step of the way. Whether you’re visiting for an annual exam or you’re in need of travel care, we’ll be there to provide you with all of the services you need. Scroll down to see a list of the services available at our Ashburn location. 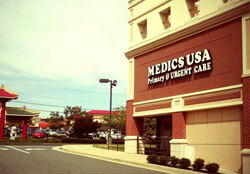 The Medics USA office in Ashburn offers both primary care and urgent care. We are accepting new patients. We accept almost all insurance plans, Medicare, and Medicaid, and also provide discounted service for people with no insurance. Farsi spoken. Our Ashburn office is conveniently located in the Ashburn Village Shopping Plaza on the corner of Gloucester Parkway and Ashburn Village Road. From Route 7, take Ashburn Village Road south. Go past the Sports Pavilion on your right. Immediately after the Pavilion is the Ashburn Village Shopping Center, also on the right. From the Dulles Toll Road, take the Claiborne Parkway (Exit 5) and drive north to Gloucester Parkway.Turn right on Gloucester and drive to Ashburn Village Road. The shopping center is on the left. We offer same-day appointments at our Ashburn office – call today or book your appointment online! Located in the Ashburn Village Shopping Plaza, to the left of the Giant supermarket, next to the Dairy Queen.